It is the fifth launch of a domestically produced satellite since 2009. 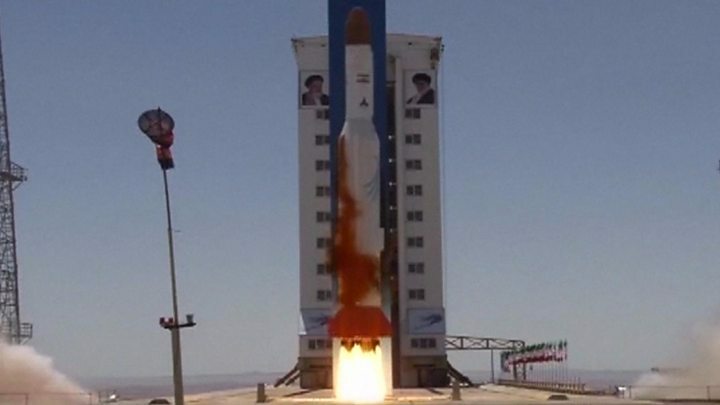 Iranian state TV said the launch vehicle could send a 250kg satellite to an altitude of 500 km (300 miles). US state department spokeswoman Heather Nauert said that if confirmed, the test could violate UN Security Council resolutions. Iran had vowed to respond to the latest set of US sanctions, which targeted 18 entities or individuals that had supported Iran's ballistic missile programme or the country's elite Revolutionary Guard Corps. The new sanctions came a day after the Trump administration certified that Tehran was complying with a 2015 deal to limit its nuclear programme. But the state department said Iran's actions in the Middle East were malign and undercut any "positive contributions" from the nuclear deal. Iran's parliament voted earlier this month to fast-track a bill to increase funds for Iran's missile programme and the Revolutionary Guards.